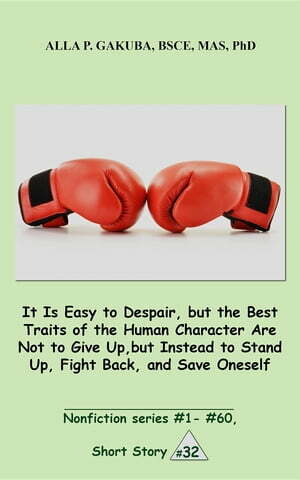 Collins Booksellers - It Is Easy to Despair, but the Best Traits of the Human Character Are Not to Give Up, but Instead to Stand Up, Fight Back, and Save Oneself. by Alla P. Gakuba, 9781943131624. Buy this book online. One day I had a dream—to get my doctoral, or PhD degree. By that time I had a record of achievements and had no difficulties to be accepted to any university of my choice. The problem was, I was a woman, a structural engineer, and in 1980s not many women had PhDs. With great anticipations I started my doctoral program. Only to learned that, before me there was another woman who was attempting to get her PhD. She had no chance, they failed her. The same objective the chairman of my major department set up for me. There were 3 attempts to fail me. The 1st attempt was—during an oral exam. You see, when my time come to take a final exam, before starting on my dissertation research, the university change the rules. Now, instead of a usual 3-days written exam, the final exam (the 1st time in the university history) was—oral. That way, in an oral exam, there would be no record of my answers. So, how could I prove that my answer were correct? How I kept finding solutions, at once, taking risks and fighting back, I share it here, in this story. Encouraging you to do the same and save yourself.